The Wings found themselves down by two goals after 20 minutes and could not find a way to get back into the game. Detroit made it a 2-1 game with an Ehn goal in the second period. Chicago scored in the third to make it 3-1, Nyquist gave the Wings some life to make it 3-2 with about 4 1/2 minute left but Kane scored a minute later to mke it 4-2. Chicago added an empty net goal and that is how the game ended. 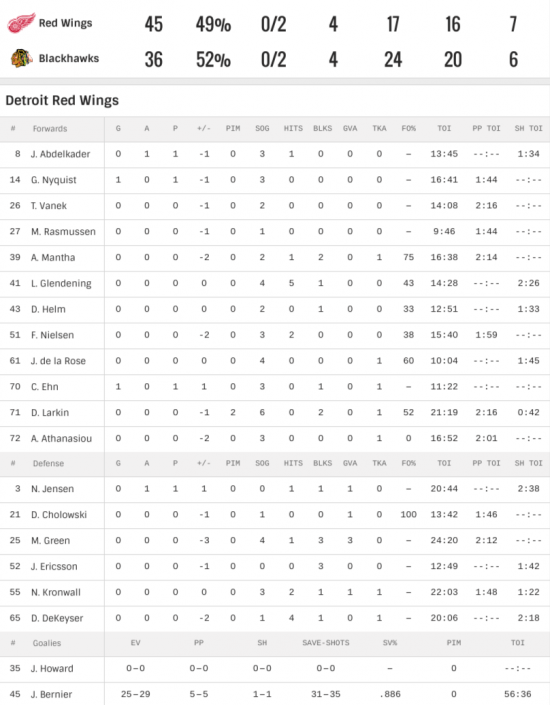 Goals and Detroit stats are below, next game is 8pm ET on Tuesday in Nashville. The whole team looked like an AHL team. Too much fun after hours with the Dads? Whole team looked like it had a hangover. Still a higher save % than Howard’s last two games, but I appreciate the double standard. Not one to defend over-reacting wingsfans, but I have to agree the Bernier has not looked good, he seems like he fights the puck an awful lot, gives up a lot of uncontrolled rebounds, and swims too much in the crease. That said, he’s not getting regular starts that might otherwise put him him in a better rhythm. As far as save %, shouldn’t the backup get more time against the poor offensive teams? Unsure how Blash has been deploying him this year. Obviously the blackhawks aside. I don’t think you can totally fault Bernier on the first two goals. The next two, yes at least more so. But the Wings D is too damn slow. All joking aside, Bernier came here knowing he would be a backup. His numbers are awful, even with scoring up. I even liked the signing this summer. Bernier may not get his “rythym” (even though he is mostly a career back up, so hes used to it?) but Howie gets more starts behind this Datsyuk forsaken defense, and is still (pre all star game) top 3 in 5v5 save percentage.